“It was kind of a week of WTF,” says Susan Rice. “Or two. 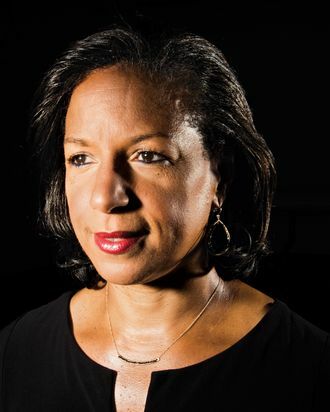 Because it’s something made up out of whole cloth.” Rice is sitting in her office on the American University campus in the leafy neighborhood about four and a half miles northwest of the building — the White House — where, until five months ago, she worked as national-security adviser. She’s talking about the moment President Trump suggested to the New York Times she was a criminal for seeking the names of Trump-transition officials who’d come up in surveillance of foreign agents. The room is filled with Star Wars posters and figurines; Rice, a distinguished visiting research fellow in the School of International Service, quickly notes that they belong to a male colleague on sabbatical and that this was the best available corner office (still none too large). Rice, dressed Friday academic-casual in a white blouse and skirt, will be getting her own digs by August. Before the Trump onslaught in April, which brought with it a barrage of incoming fire from the right-wing media (Rice’s action was proof that the Obama administration “weaponized” intel to destroy its foes, howled Rush Limbaugh), she had been relaxing: vacationing in the Maldives for two and a half weeks, playing lots of tennis, doing some writing and speaking, and “trying to be as present as I can for my kids, my husband, my friends, all the people who put up with me for all those years that I was torn in multiple directions.” (Her son is a rising sophomore at Stanford, and her daughter will start ninth grade this fall.) After four years of the enormous pressure of waking up every morning to top-secret security intel and spending 45 minutes briefing the president every day he was in Washington, a rest was feeling great. Then, in early April, the story broke, first from Trumpophile writer–troll artist Mike Cernovich, then in a Bloomberg piece, and then everywhere, saying she had asked the intelligence community for the blacked-out names of American citizens appearing in intelligence reports — the now infamous “unmasking.” It was widely assumed that it was a leak from inside the Trump administration aimed at deflecting attention from Russia, and for a few days it did just that, especially after the president told the Times: “I think the Susan Rice thing is a massive story. I think it’s a massive story. Rice tells me she doesn’t want to “get into the sausage-making” of how she planned her response, but it was surgically done: She gave one interview, to Andrea Mitchell, saying, “I leaked nothing, to nobody, and never have and never would”; intelligence-community professionals from both parties stepped forward to confirm that what Rice had done was neither wrong nor extraordinary. But Rice had been a particular focus of the right ever since that Sunday after the Benghazi-consulate attack in September 2012 when she stuck to the script of the later-disproved CIA talking points, and it’s been after her ever since.